« Kiva! Help save the world… for FREE!! Working on the theatrical adaptation of The Blue Bear at Perseverance Theatre during 2010-11 had a transformative effect on me. I had realized fairly early on in the process that there were things about this story that were inaccessible to me because I simply didn’t have the relationship to the natural world that the two principal characters in the story had. It isn’t that I think that you need to share the principal characteristics of characters in order to portray them, but in this case, I felt that the vague sense of wonder and respect that I did feel for the natural environment of Alaska was too easily mistaken for the very specific and deep relationship that Lynn Schooler and Michio Hoshino had with it. It was too easy for me to think I understood it. So I went out with the Kayak rangers of Holcolm bay and at least had the sense that I understood the place, knocked down a bit. The experience didn’t give me the same depth of understanding, but I got a better sense of what it might be to have a deeper relationship to place, from which it was possible to extrapolate as an artist. The effect on The Blue Bear which premiered in Juneau in January of 2011 was of incalculable value. The summer of 2011 after the first ASTI (Alaska Summer Theatre Intensive) training program at Perseverance, I traveled up to Anchorage to look at the the Sydney Laurence theatre where we were going to remount The Blue Bear in early 2012. After spending some time at the theatre with Art Rotch, I headed over to the rather excellent Anchorage Museum. Wandering through the galleries I was struck by one room in particular. 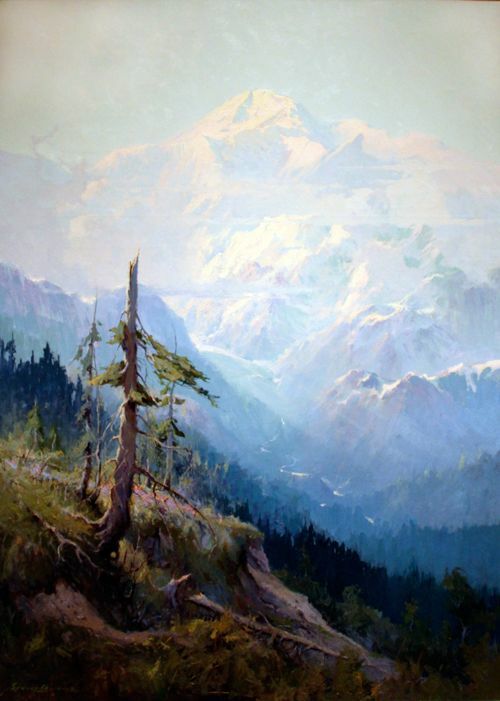 Landscapes that were poised precariously on the razor edge between impressionism and realism. And there was a subject that kept asserting itself like Mt. Fuji in Hokusai’s prints. 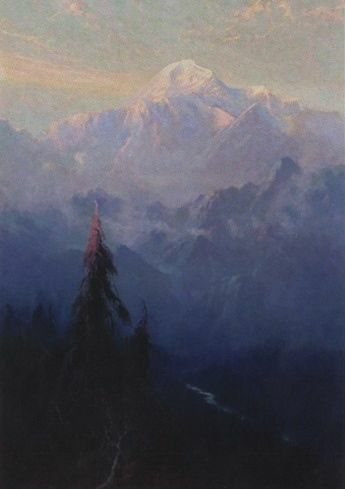 These were the paintings of Sydney Laurence, and his Mt. 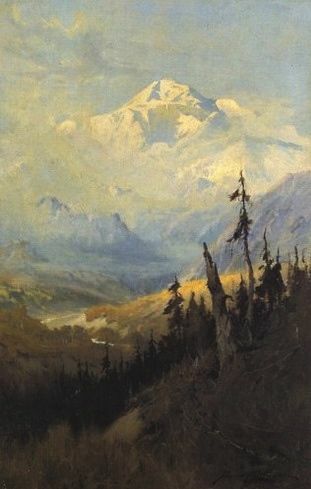 Fuji was North America’s highest peak, Mt Mckinley. Like Monet’s water lilies, reproductions do little justice to these paintings. This is how dumb I am: It took WAY TO LONG for me to realize that the theatre I had to come to Anchorage to check out, was named after the painter who’s work I was being so struck by in the museum. This afternoon in the gallery began a low level obsession in me. Mt Mckinley is more properly called Mt. Denali or just Denali. That’s its Athabaskan name. Attempts to change the name are consistently blocked by the congressional delegation from president Mckinley’s home state: Ohio. That’s how dumb the United States is! Denali means something like “The Great One”. The mountain has an origin myth/story, which I will not relate because although I’ve heard it, I don’t really understand it or have the right to re-tell it. 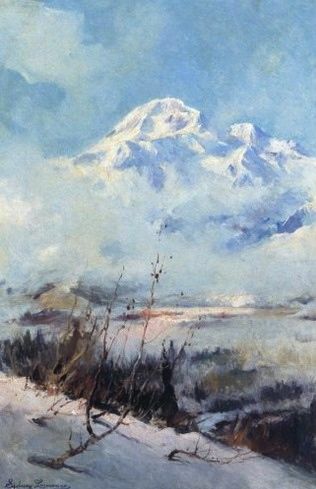 Reproductions of these works being so poor, I hurried back to the museum when I returned to Anchorage for the remount of The Blue Bear. And looking at the paintings again, the low level obsession began to focus into an impulse. It was actually very simple. I recognized this impulse. This was not a vague need to face nature, or testosterone driven need to test myself. This was an artistic impulse. I decidedly did not want to climb the mountain. It was almost the opposite of that impulse. It was an impulse to simply go to its feet and… hang out. To listen to what it might want to say to me. Or Lynn Schooler’s solo trek around Lituya bay . But I wasn’t delusional enough to automatically think I could go out into the wilderness by myself. Nevertheless I knew that we were planning on doing another ASTI in the Summer of 2012 and it was looking as though my schedule might be open after it was over. I had enough Delta miles to get me a flight up to Anchorage from Juneau. Denali Park is a bit of a drive north from Anchorage, so just as a trial balloon I asked my good friend, the Anchorage based composer and sound-designer Lucy Peckham, if she could drive me up to Denali if I came up in early July. She said we could definitely figure something out and that I could assume her help. This entry was posted on Tuesday, July 31st, 2012 at 5:56 pm	and is filed under Main Blog. You can follow any responses to this entry through the RSS 2.0 feed. You can leave a response, or trackback from your own site. What a fantastic story! “Go!” And write for us again soon! Love the story, Leon … can’t wait for the next installment. I’ve had a fascination with Denali for 20 years.